Premiumisation. There’s a word for you. A dirty word, if you’re to take the prevalent social media stance. Certainly a word that smacks of marketing departments, and of excuses for heavy-handed price-hikes. And an ever-more commonplace word in the world of whisky. 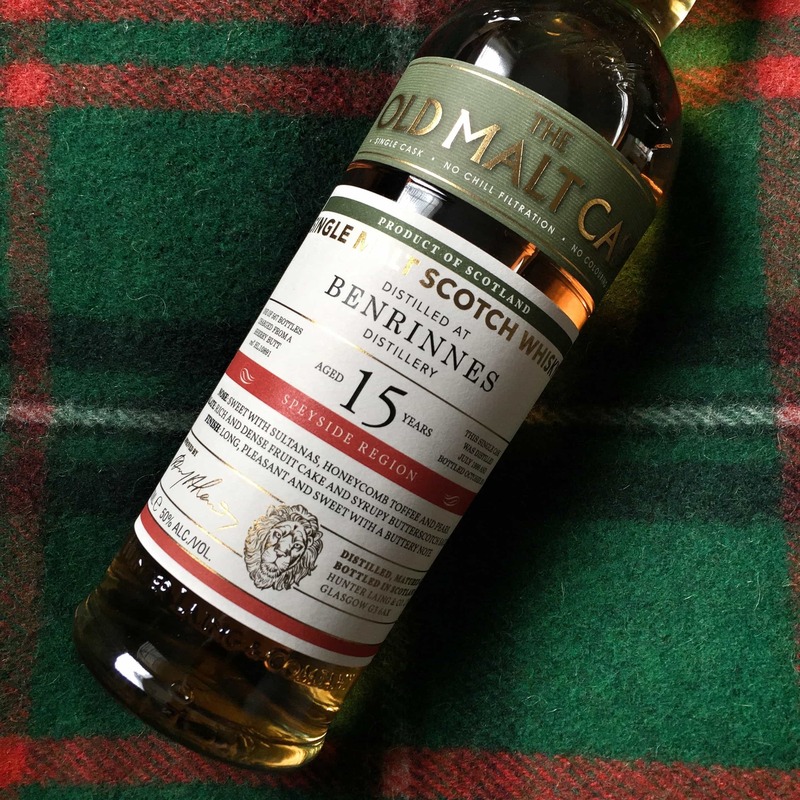 You can’t move for it in single malt; scotch or otherwise, and even bourbon – so long held as a bastion of super-affordable “drinkers” whisky – seems to be shifting focus to the limited release, and the special edition. Or so it seems to this jaded old curmudgeon. 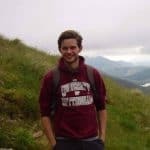 (I’m reliably informed by my colleagues that physical youth is no impediment to my qualifying for that epithet). Thing is, if you ignore the slightly vulgar terminology, and the ever-inflating prices, so-called “premium” releases are genuinely important when they’re done properly. A chance for distilleries and distillers to truly flex their muscles and lay down a marker. To say “this is us at full tilt. This is what we’re really about”. Canada has been conspicuous by its absence from this whisky sector. There’s something to be said for focussing on the more affordable end of the market, and for looking first and foremost to the general drinker. 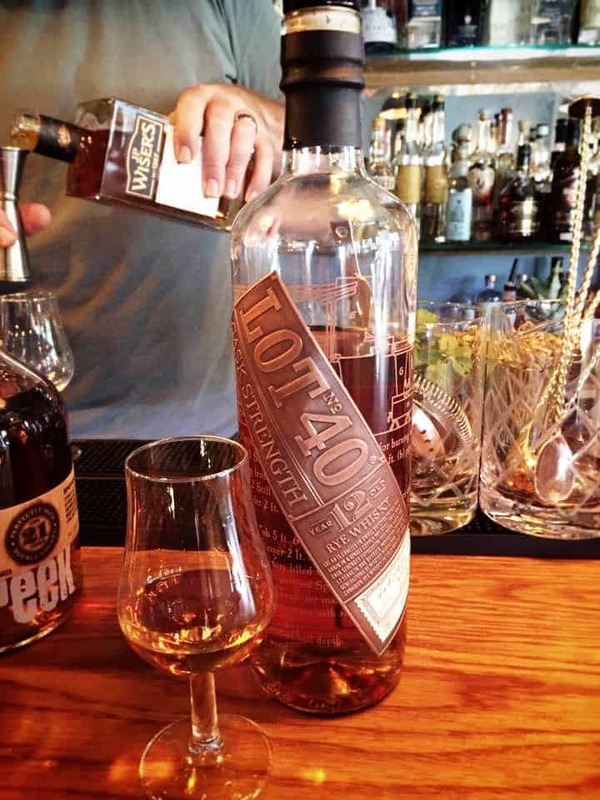 But their lack of what you might call “statement” whiskies has perhaps been a factor in putting off more experienced tipplers, who are looking for something more challenging and experiential. “Premium” Canadian whiskies, on the whole, are more easily found packaged in US bottles. And are usually only the 100% ryes. 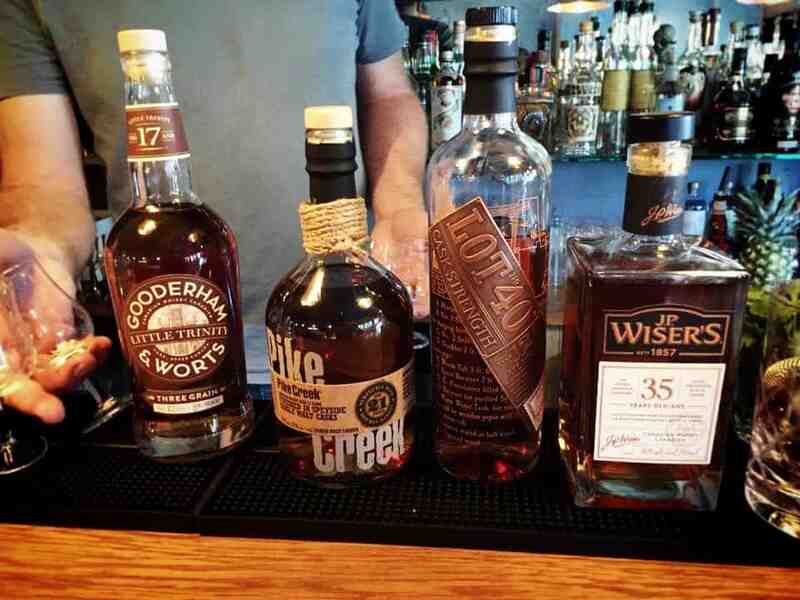 The newly launched Rare Releases from Hiram Walker are an attempt to change that. 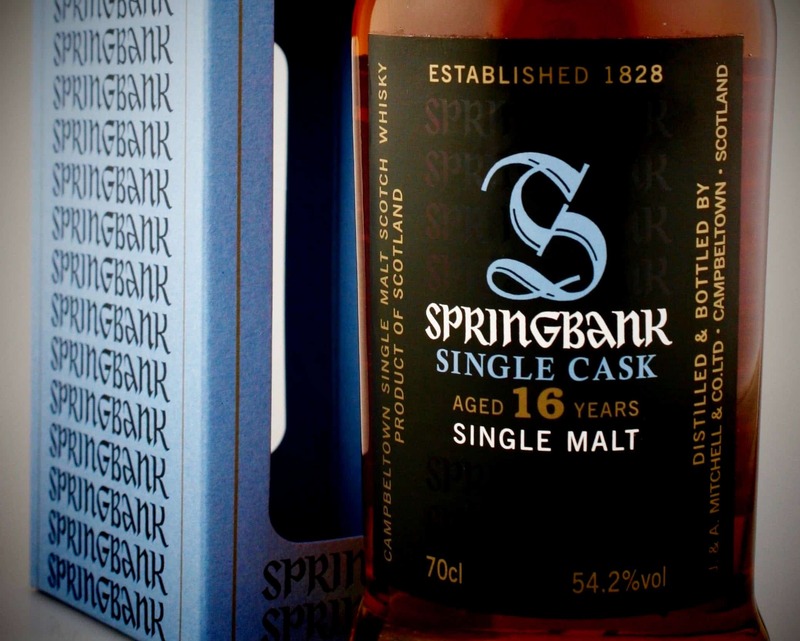 “Next level” siblings to core range bottlings from the distillery. They feature a 21 year old Pike Creek finished in Speyside casks, a 17 year old Gooderham & Worts 3-grain, a cask strength 12 year old Lot 40, and, most ambitious of all, a 35 year old J.P. Wiser’s. Which I believe is the oldest whisky Hiram Walker have ever released. I assumed they’d stay on the far side of the Atlantic, but recent rumours that The Whisky Exchange would be taking delivery of a few bottles of each prompted me into action. I had a chance to try all four at The Whisky Show, but those aren’t reviewing conditions whatsoever, spittoon or no spitton. So one grey Saturday I trotted over to the only UK bar currently serving them: London’s Stillwater. A mid-afternoon arrival meant I was the only customer in at the time; ideal for these purposes, and a very (very) reasonable £20 later I had a glass of each. On the nose: Musky and leathery. Old furniture. There’s a maturity to the wood; a certain sense of earthy aftershave. Light dusting of sweet corn oil. Slightly vegetal, in a forest floor sort of way. Touch of char. Rye grows as the whisky sits. Not at all aggressive. In the mouth: Really rounded palate, and the wood offers polish and depth. There’s a certain lifted green apple note. Again, it’s not aggressive, but nor is it faint. Really grows in the glass. There’s a little caramel and a touch of peach. Grains all harmonise nicely. Elegant. On the nose: That dusky old furniture again, but this nose is creamier; more buttery. There’s honey, ripe and fresh orchard fruit, and a little tobacco too. After 5-10 minutes, and some warming, a waft of smoke appears. Again, not aggressive; complex and relaxed. A little quieter than the Gooderham & Worts. On the nose: Unquestionably the most intense and wonderfully wild nose of the Rare Releases. The Lot 40 genes show through in big violets and magnolias. Massive toasted rye bread too, and lashings of black cherries. Dill and fennel, as you’d expect of a high rye, but sweetened somehow. Just a huge, huge nose all in all, but huge on aroma, not on over-the-top alcohol. On the nose: So much freshness for a 35 year old, and that rye is working very hard. Lots of Lot 40’s floral character, but less intense, as you’d expect. Lilacs and violets, plus a touch of rose. Black pepper and polished oak, with a whole bushel of green apples. As it sits, deeper citrus notes of dried oranges creep in. Mature, dusky aspect as seen in Gooderham and Pike Creek. 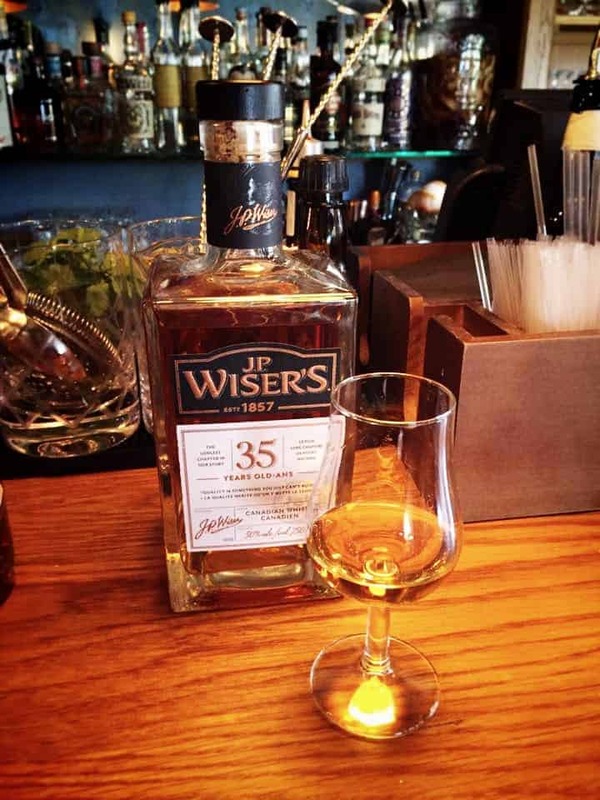 In the mouth: The vibrancy of palate that the Wiser’s 18 doesn’t quite have is here – hurrah! Really fruity; apples and pears at first, before moving in a more stone-fruity direction. Nectarine, to me. The black pepper, toasted oak and clove maintain grip throughout, structuring it brilliantly. Again, the suggestion of old oak boards maintain a hand on the tiller. 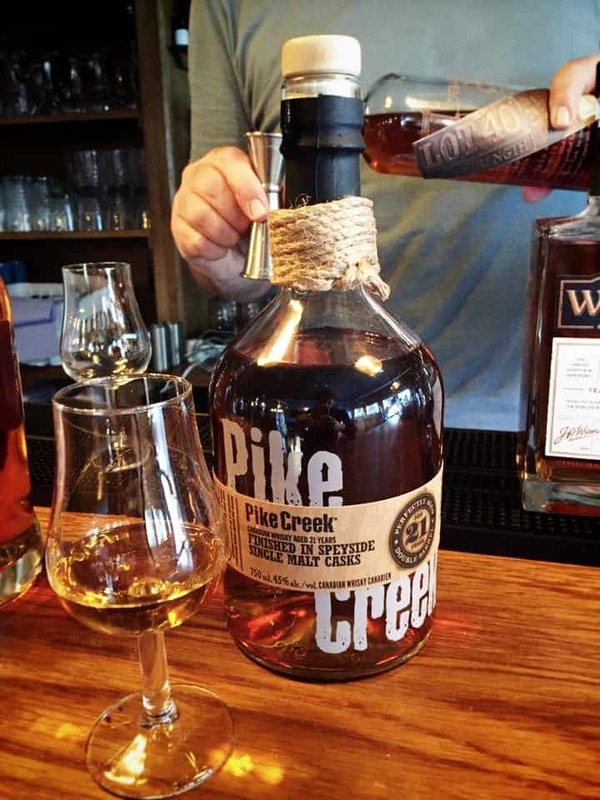 A resemblance to single grain Scotch, but not to the degree seen in the Pike Creek. Long finish. This is a sort of whisky the UK simply hasn’t seen from Canada before. They’re such an eloquent statement of what Canadian whisky is all about, and I think that’s what I like best about them. There’s no concession to fashion, no attempt at conformity to what drinkers of malt or bourbon are used to. Because they’re not malts or bourbons, they’re Canadian whiskies. And they’re really exceptional. What I’ve learned about Canadian whisky in the last year is how much they unfold in the glass. That’s true of a lot of whiskies, but never to this degree. After five to ten minutes, they were completely different beasts to when they were first poured. 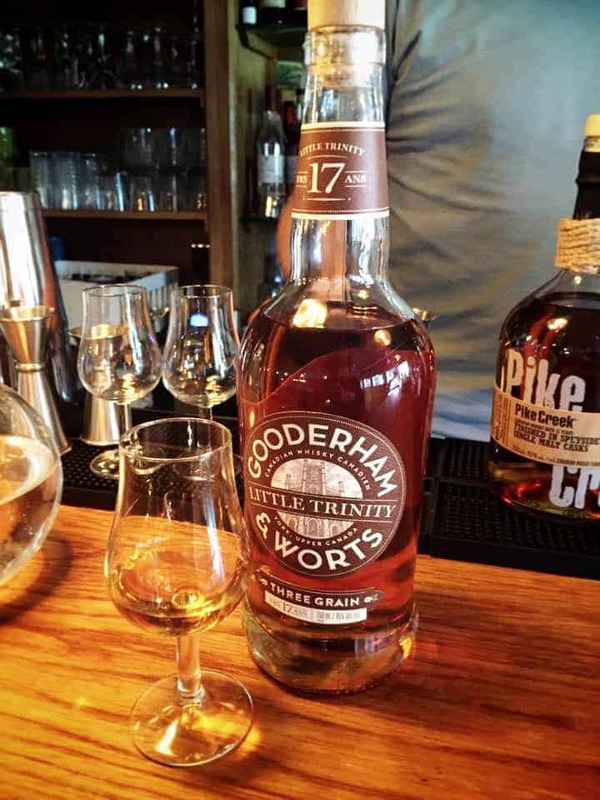 They’re not shouty with new oak or wine casks, as bourbon or scotch might be; they’re all about complexity and layering – of barrels and of grain. They’re whiskies to be given time; cerebral things that demand and deeply reward patience. Other than the Lot 40, of course, which is as big and brash and vibrant as you’d expect a 100% rye to be. I’m thrilled these are coming to the UK, and will be even more thrilled if the prices line up with what they’re sold for in Canada. That would be £48 for the Gooderham & Worts, £54 for the Pike Creek, £42 for the Lot 40 and £99 for the J.P. Wiser’s. Which would make them remarkably competitive. I haven’t scored them, for the same reasons Mark didn’t score the Balvenies. Not my usual setting. I’ve also not noted colour; as you can tell from my photos, Stillwater is on the shadowy side! For what it’s worth, my order of preference from highest to lowest would be Lot 40, J.P. Wiser’s, Gooderham & Worts, Pike Creek. To my taste the Wiser’s and the Lot 40 are a class above the other two which, being super critical, could do with just a little more engine. Honestly though, I think they’re all pretty great, and I will be checking The Whisky Exchange daily for their arrival. My advice: seek them out by glass or by bottle, try each one, and find your horizons wonderfully broadened. If this is the direction Canadian whisky is heading in, I’m all for it. More please.